Here I will describe the setup and equipment that make up my reef/cuttlefish factory and training grounds. 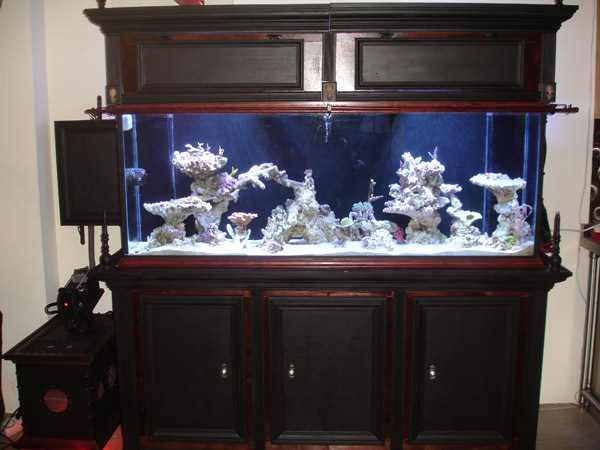 To check out my old 50 gallon cuttle system, click here. The tank itself is 150 Gallons with 1/2 inch Glass. Almost everything other then the mechanical equipment were custom made including the cabinet, hood, sump, and auto top off resevoir. The goal is to house and breed Sepia Bandensis in a mixed reef system. This project is an attempt to go beyond the tradional construction of a salt water system, but to make it an artistic endevor as well. 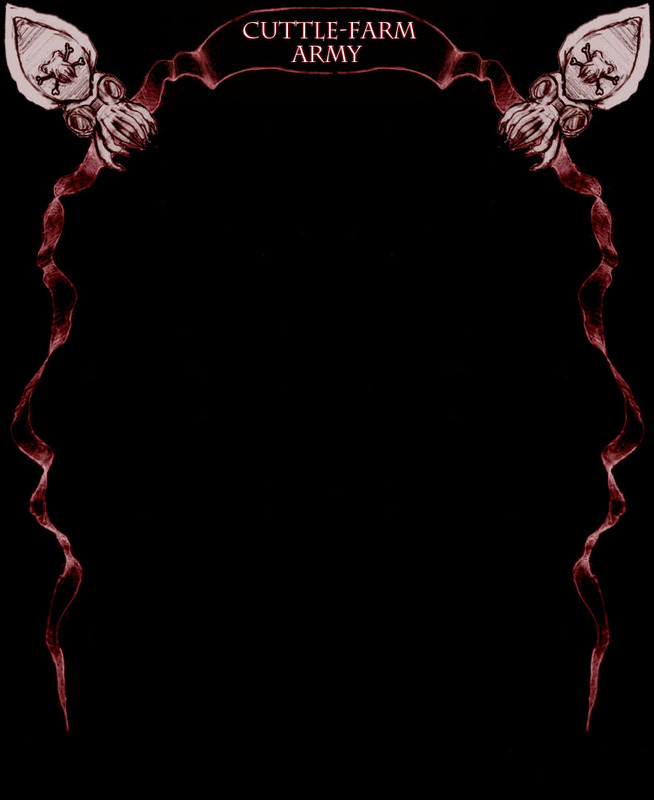 Like usual with my creations, the aesthetics are in tune with an old mad scientist feel. 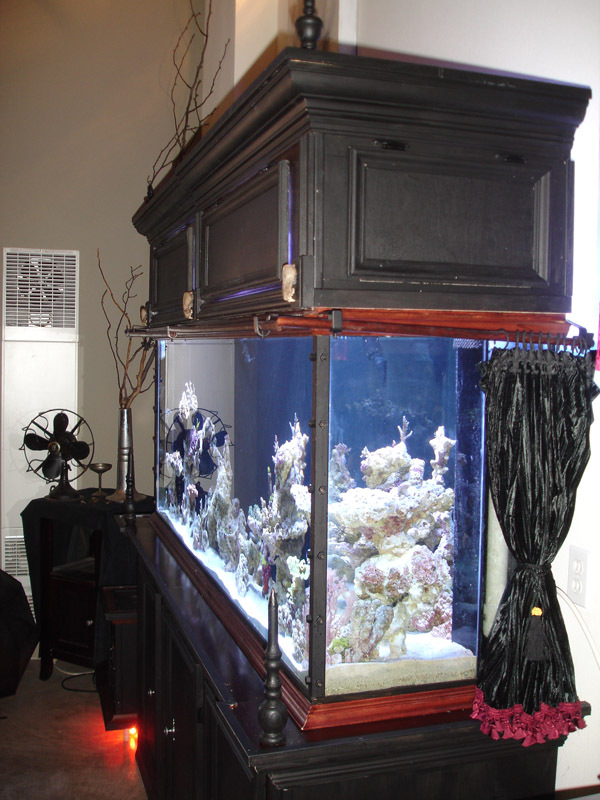 The main tank is a 150 gallon Glass tank with custom wood stand and hood. Dimensions are 72.5"Long x 18.5"Deep x 28" Tall. I drilled the back for two 1" bulkheads for internal overflows. They are located on both sides of the tank in the rear. The hood is two seperate pieces, designed to slide out to allow me to reach all the way down the tank. 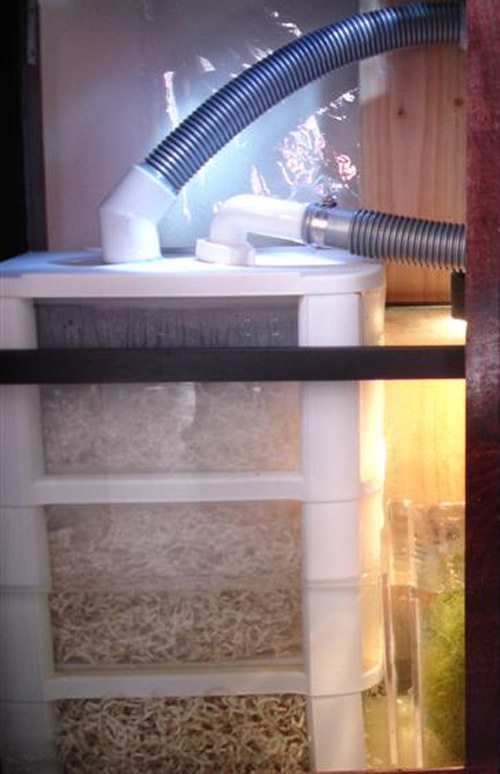 It also has doors that allow for quick feeding or access to the tank. 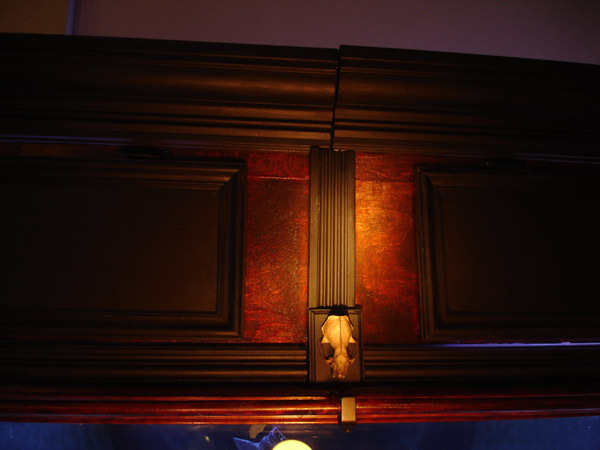 If I need to take the hood down, All lighting and wiring can be easily disconnected. Making this a reef/cuttlefish tank requires some deviations from the typical reef setup. I have created a lot of shelf rock towers and structures to allow for a lot of varying degrees of lighting and shade. Sepia Bandensis live in reefs, but prefer lower levels of lighting. Many caves and shaded areas are available to them with my current setup. Rock design has always held a feeling of Zen to it for it will determine the water flow through the tank. My goal is to not only give shade and housing to the cuttles, but to do so by creating seemless paths for water flow. A path of least resistence will allow optimum flow efficiency to encourage all detritus to not settle and stay in the water column until it reaches the overflow to be filtered. Lighting consists of dual 250 watt metal halides with 14k bulbs. Six 39 watt T5s are also used. Four for supplementation and two as 10k. The metal halides are on for only 3 hours a day from 4pm - 7pm. 10k T5s are on from 9am-4:30pm and 7pm-9pm. The four supplemental T5s are on from 3:30pm-12:00pm. With this light schedule, the halides are on only for a short amount of time for the corals. Most of the day it is lit with only t5s. 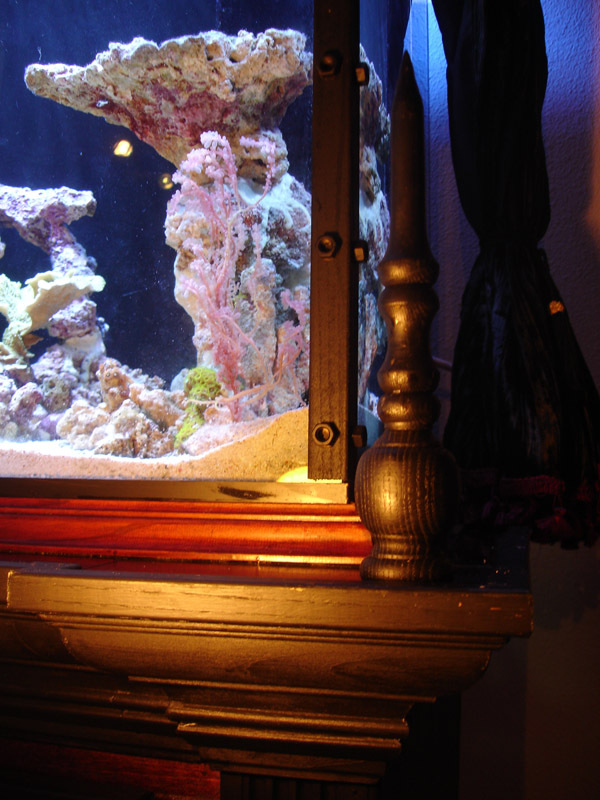 The 28" depth of the tank also causes a drastic reduction in PAR the further down the tank you go. Temperature will range from 72-77 degrees which will make the cuttlefish more comfortable but slower growth rates in corals due to slower metabolism. 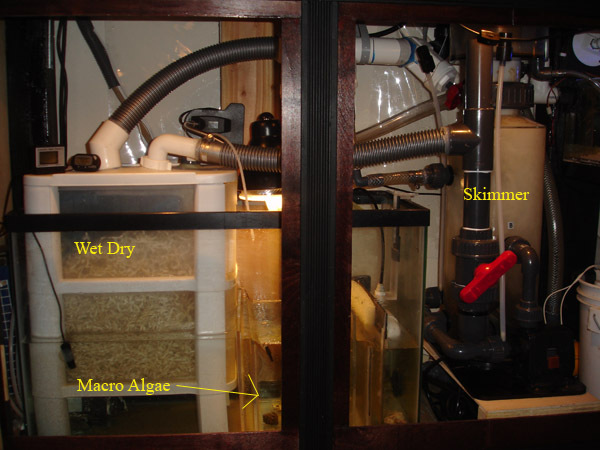 Another deviation from modern reef systems is my inclusion of a home made wet dry system. I am using less then the typical live rock for biological filtration and with an animal that produces as much waste as the cuttlefish, I will need more filtration. As long as I keep the bio bale clean, I should not have any problems such as the nitrate buildup. For circulation, I am running a Ecotech Vortech pump. It huge amount of dispersed flow with the motor housing on the outside of the glass is perfect for a lower temperature tank. The flow from the vortechs are very complimentary to rockwork towers for it pulls and pushes water from all sides of the towers. To aid in random flow, I am using a Wavy Sea wave maker which alternates the water flow set to about 190 degree rotation. 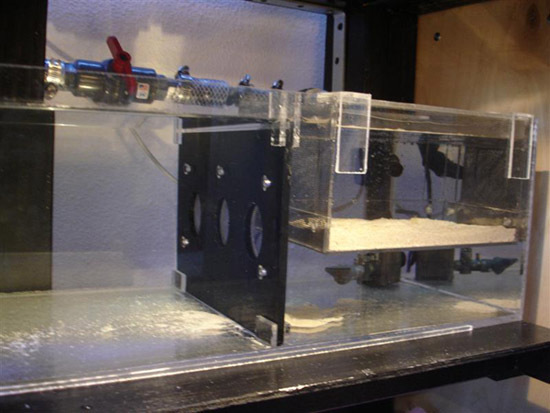 The sump is made from a 30 gallon long glass tank with 5 acrylic baffles. The skimmer and return pumps are plumberd externally to reduce heat. 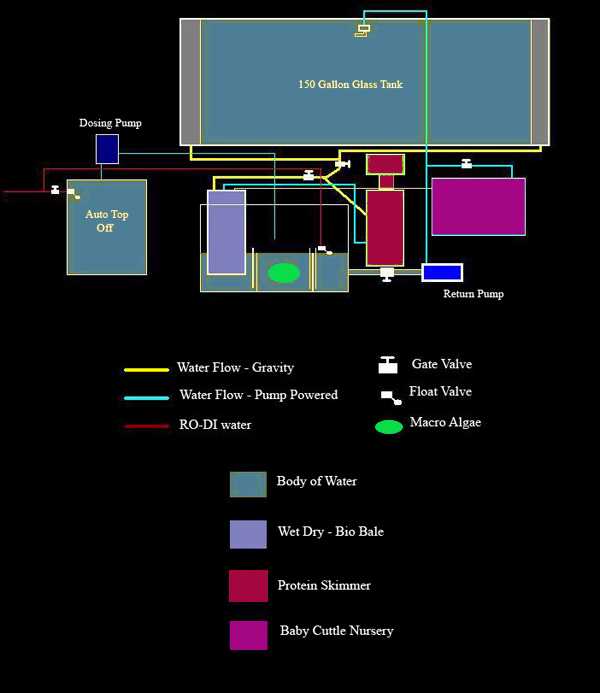 All pumps are outside of the water column, so little heat is transfered. -Pan World 50px-x Return Pump modified with external fan to run cooler. -Macro Algae for nutrient export lighted by a 120 watt equivalent flourescent daylight bulb set on a timer to come on at 11:00pm - 9:00am. The nightly schedule aids in reducing the PH drop that comes during the night. The refugium section is designed to tumble the macro algae without the use of any additional pumps. This allows for even light exposure. -Auto-Top Off system connected to a Typhoon III RO-DI unit and resevoir to fill any evaporated water and dose kalkwasser. An old laboratory Buchlar Polystaltic Pump is used for slow controlled dosing of the kalkwasser. -Custom made wet dry system with media/drip plate. This was made from a drawer system to allow easy access and cleaning. The baby cuttle section is made from 1/4" acrylic and is 20"Long x 12"Deep x 7"Tall. It has a small overflow that will drain to the wet dry sytem in the sump. 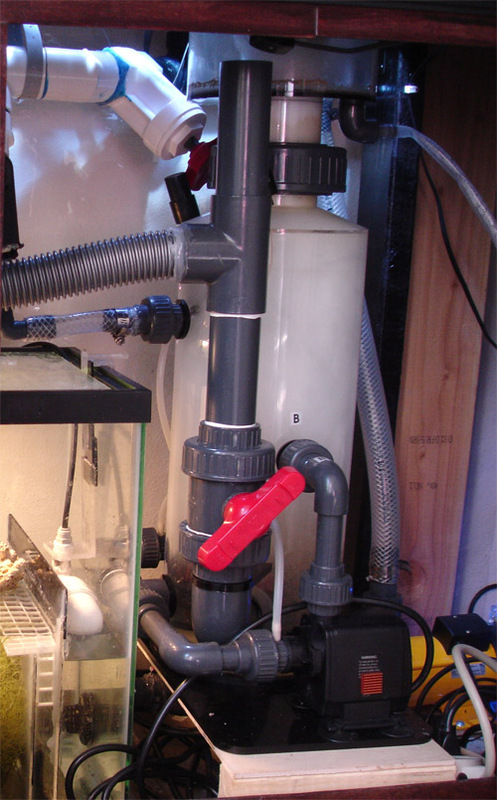 The main return pump from the sump is T'ed off and controlled by a ball valve that feeds the baby cuttle section with water. A divider can be added to this section to safely divide the nursery in half. For eggs and newborn hatchling, I have also created a removeable breeding net style chamber. Since Ive run out of room in the stand, I decided to make the auto top off resevoir look nice. A 20 Gallong tank, Buchlar Pump, and two float valves are all the functioning parts. Everything else was added for aesthetic purposed. 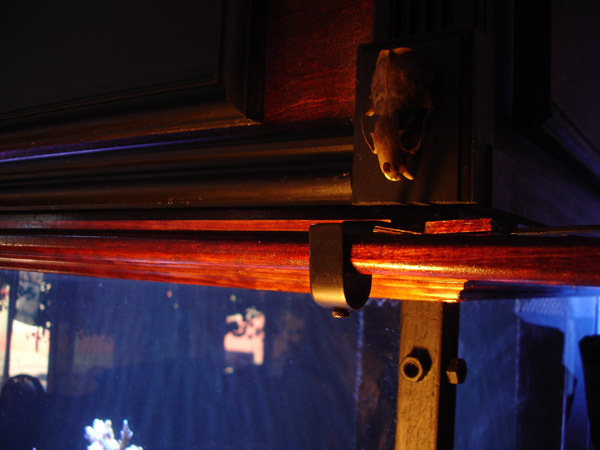 The 20 Gallon tank has a custom made wood housing and framework. The buchlar pump was painted and placed on a custom made rotating mount that rests on top of the tank. The RODI unit is in my bathroom on the other side of my house. Tubing from the unit goes through the house and hits a T adaptor. From the T adaptor, one end will goto a float valve that sits in the sump, keeping the water level constant when evaporation occurs. The other end of the T adaptor goes to a on/off valve that then feeds to another float valve that sits in the 20 gallon resevoir. This will allow water to fill the 20 gallon to the top and automatically shut off. Once this is full, I shut the valve off that feeds the resevoir. I then place kalkwasser and any other additives to the water in the resevoir. This water is then pumped by the Buchlar pump at a rate of about 1 drop every 1.5 seconds 24 hours a day into the sump. Kalkwasser must be added slowly to the tank since its PH is very high. The amount of liquid being added to the sump from the resevoir is at a slower rate then the tanks evaporation rate, so anything that is left over is automatically filled by the rodi unit that feeds directly to the float valve in the sump. The 20 gallon resevoir lasts about 3 weeks until it needs to be refilled. With this design, no mechanical float switch is used, so theres less of a chance for failures. The pump even if the speed adjustment knob is accidentally changed (which is unlikely), not much kalk will go into the system. Power outages will not afect this setup since the intake tube in the resevoir is lower then the outake tube in the sump. The only real concern is if the float valve fails and rodi is left to freely enter the sump. Tired of having to crawl to different parts of the stand to turn things on/off, I created a control center. 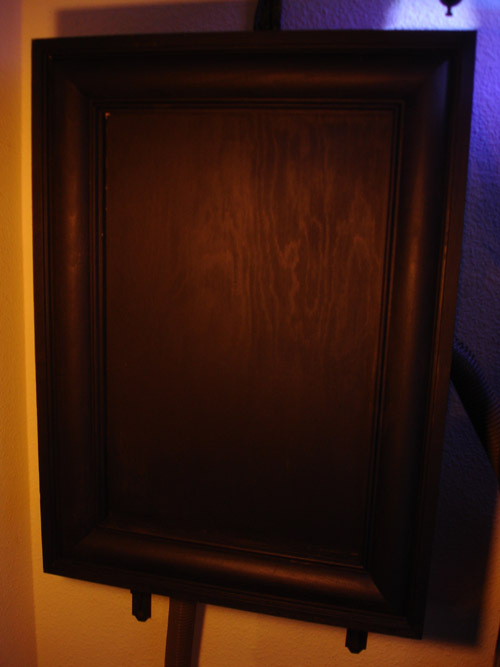 Its basically a wood panel box with a DJ 8 channel power strip. 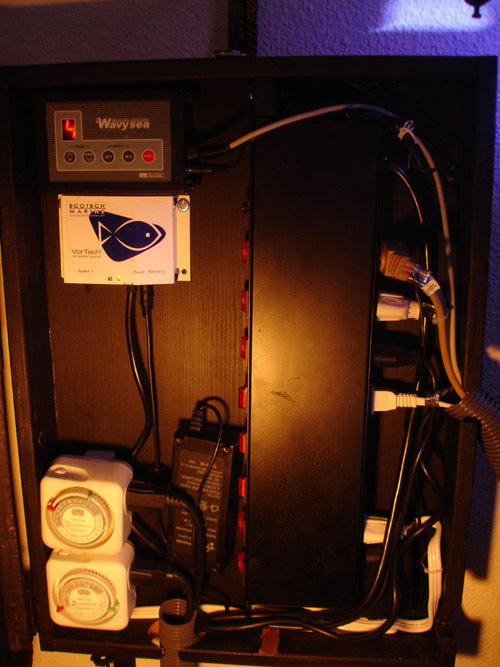 It also contains the controllers for the Wavy Sea and Vortech as well as the timers for the lights so I can easily turn them on or off manually.